A stimulus 2-6 dB higher than expected hill-of-vision [suprathreshold] is presented. The response is recorded as seen [normal] or not seen [defect]. This is also known as the “Threshold related strategy”. These are also known as the “3-zone screening tests”. The VF is divided into 3 categories: Normal, relative defect and absolute defect. After quantification of defects, this test is performed. Thresholds are measured at the locations which are determined to be abnormal. A single-level threshold test (given above) assesses defects 6 dB higher than the hill of vision, therefore shallow defects and early progressive depression of the VF can be missed. The test can be very time consuming if many points in the field of vision are abnormal. These programs measure the DLS in the central 240 to 300. The sensitivity at a particular point in the visual field is measured in decibels (dB) by convention. The DLS at every point in the VF is assessed using the 4-2 staircase or bracketing algorithm. The perimeter projects stimuli ranging from 0 dB (brightest) to 50 dB (dimmest) in a graded fashion to determine the threshold of a particular point and this technique is called the “staircase” or “bracketing strategy”. The stimulus strength is increased in 4 dB increments till it is perceived. Subsequently the strength is reduced by 2 dB till it is no longer perceived. The process involves a double-crossing of each point and tries to attain maximum accuracy in grading threshold of a particular point. Testing starts with a suprathreshold [seen] or infrathreshold [not seen] stimulus. In a suprathreshold stimulus, the intensity of the stimulus is decreased in 4 dB steps until the stimulus is no longer seen (threshold crossed). The stimulus intensity is then increased in 2 dB steps until the threshold is crossed a second time and the stimulus is seen again. The Humphrey Perimeter uses the intensity of the last seen stimulus as threshold. If the initial stimulus is close to the actual threshold the test can be done faster. Humphrey Perimeters use a “region growing technique” to determine the starting level for each point. After testing the fovea and blind spot location the threshold is measured at a single point in each quadrant. The threshold level measured at these 4 cardinal points is used to start testing the adjacent regions. If the thresholds are more than 5 dB from the expected values, the location is retested. The second result is printed below the first in parentheses. The DLS is determined at every point in the VF. However, instead of the 4-2 bracketing strategy, the threshold is measured using 3 dB steps and the threshold is crossed only ONCE. By using SITA the test time is reduced by half. SITA-Standard and SITA-Fast capture twice the amount of data in the same time as a Humphrey Full Threshold and FastPac respectively. Testing is started at the level which is near threshold. The time between presentations of stimuli is customized to the patient’s response time, making it more user-friendly. The strategy is able to calculate the false-positive and false-negative responses from the threshold measurements, eliminating the need for separate testing of the false-catch trials. Thus, the test time is reduced by 6% compared to a full threshold strategy. SITA uses artificial intelligence and computer modeling, incorporating probability models of normal and glaucomatous VFs to provide more efficient testing of the VF. The testing is interactive. Thus, the response from the patient is used to predict the future responses. The data captured is incorporated in probability models of normal and glaucomatous VFs, normal age-corrected threshold values, patterns of glaucomatous damage and multiple frequency of seeing curves in normal and abnormal states. At the end of the test, the threshold is calculated based on all the data captured by the system. The program is also able to discard the likely false responses. The program estimates the threshold expected at each point on a continuous basis and stops testing when the estimated error is less than a predetermined value. SITA Standard takes longer to perform as the confidence limit is narrower for SITA standard than SITA Fast. Due to the lower error in SITA Standard, the resultant variability is low and it is more reliable than SITA Fast for future comparisons. Although SITA-Standard is comparable in reliability to Full threshold strategies, these 2 strategies are not directly comparable. Defects appear shallower on SITA-Fast because of less patient fatigue. In this test a blue stimulus (440 nm) is presented on a background of yellow illumination. The yellow background desensitizes the green and red cones, while the blue stimulus activates the blue cones. Thus, the blue cones and their ganglion cell (K or kainocellular cells) connections are tested. SWAP detects VF defects earlier compared to white-on-white perimetry. However, variability in the inter-test sessions is greater with SWAP. It is also affected by lens-induced changes in the elderly. This test also takes 15% longer time than full threshold testing. Interpretation of the VF results requires the SWAPac on the Humphrey Perimeter. The grey scale does not useful in interpretation of the SWAP results. It is not known if SWAP detects changes early due to relatively earlier damage to the blue/yellow system or testing of only a subset of the visual system enables earlier detection of the VF defects, even though the damage is not selective. This tests the larger diameter M (magnocellular pathway). These cells occupy 3% to 10% of the ganglion cell population. M-cells are particularly susceptible to glaucomatous damage and are damaged early in glaucoma. Full threshold FDT tests can be completed in less than 6 minutes per eye, while suprathreshold screening takes a minute. In FDT, 17 regions in the central 200 or 19 regions of the 300 of the VF are tested. Each stimulus is a series of black and white bands flickering at a frequency of 25 Hz. A normal eye perceives the illusion of twice the number of bands more closely spaced. Glaucomatous eyes have preferential damage to the M-cells and they require higher contrast to detect the frequency doubling illusion. 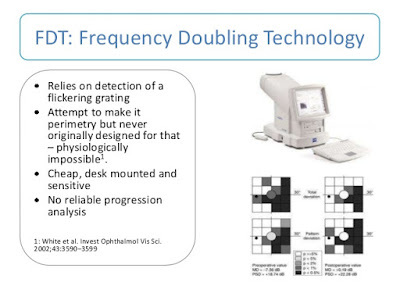 FDT has a 97% sensitivity and specificity in detecting glaucomatous field defects.